My last installment was the Sand Bar restaurant in Huron. 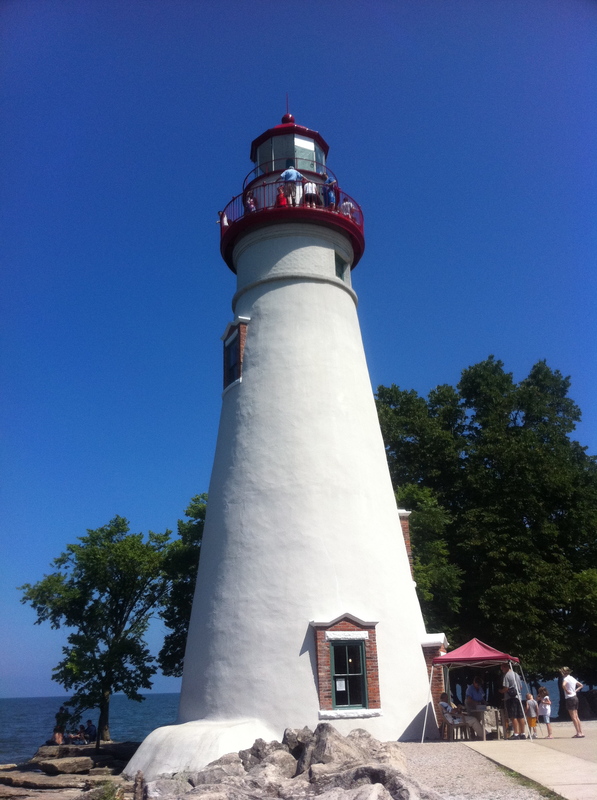 Up this week is the Marblehead Lighthouse in Marblehead. The lighthouse is on land that is a state park, which is free to enter. 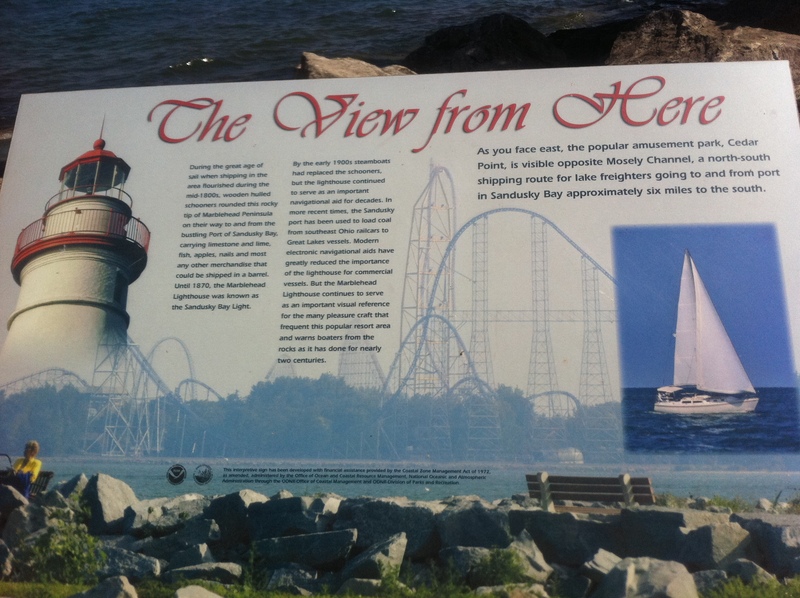 The lighthouse is on the shore of the main land, west across the Mosely Channel from Cedar Point and south of Kelley’s Island. I visited on an idyllic and hazy day (hence no good pictures of Cedar Point), but when a storm is coming or there’s lots of wind, this spot could easily become much less peaceful as the base of the lighthouse is just feet from Lake Erie. Earlier this year, cracks were discovered in the tower, but officials determined they did not affect the structure and the lighthouse is still safe and visitors can continue to climb the 77 steps to the top for $2, which I did many years ago. The lighthouse was built in 1821 and was 50 feet tall. Fifteen feet were added in 1903. The area became a state park in 1998. The keeper’s house is open for tours as well, with information about the operation of lighthouses, the nearby quarry, and historical boating and shipping. Entry is free, but there is a donation box. Marblehead Lighthouse State Park is located at 110 Lighthouse Drive, Marblehead. Information about the park is available by calling the East Harbor State Park at 419-734-4424. This entry was posted in North America, Photos, Saturday Spotlight, U.S. and tagged History, Lighthouses, Ohio, Photos, State parks, Travel. Bookmark the permalink. Thanks for your comment! Thanks to my boyfriend, who lives across the country, I really have been able to focus on the U.S. rather than flying off to Africa like I expected. It has been a wonderful turn because I hadn’t seen any part of the western U.S. and now I’m moving there. The rest of the world will wait for me and I can feel better about having experienced my own country. And no matter where I am, I will always love Ohio and will miss the miles and miles of corn and soy beans.